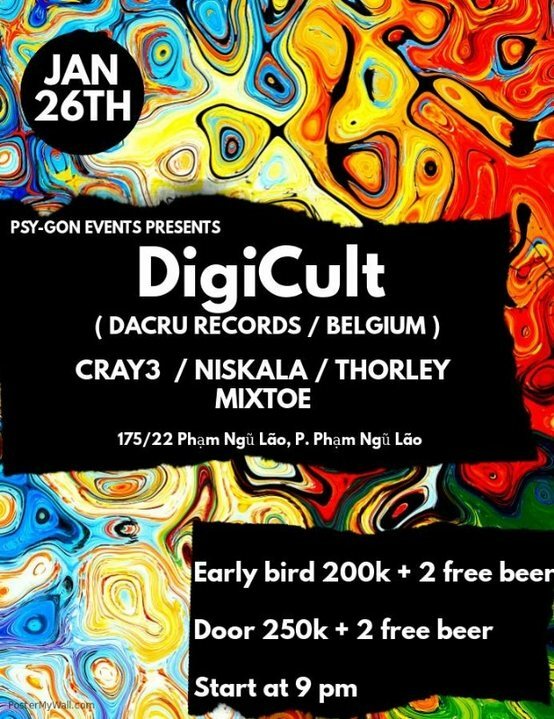 Since DigiCult was founded back in 2003, they have worked their way up to the forefront of the psychedelic movement within the trance scene. Their style has always been described as deep, intelligent full-on morning, with a strong oldschool touch. Beautiful 'back to the roots' melodies fused together with ethereal female chants and ethnic instruments from the orient. Having spent the last decade traveling all corners of the globe, the most memorable times include visits to Japan (Vision Quest The Gathering, T.P.E. ), Hungary (Ozora, S.U.N. ), Germany (Full Moon, Fusion), Mexico (Equinoxio, Ritual), The Netherlands (Every edition of Psy-Fi Festival), Brazil, Israel (TFN, Groove Attack), USA, Australia, South Africa (Alien Safari), Russia, India, Thailand and countless more. In August 2006 their debut full album ‘Avenida de Bélgica’ became the blueprint for the unconditional energy in their music, light and very psychedelic in nature. The second full album ‘Out of this World’ (2008) was an extremely successful concept album including iconic tracks like ‘star travel’ and ‘days in space’. The third album ‘The Lucid Nation’ came in May 2012 continuing the same path... driven, emotive and psychedelic where the bond with U-Recken became even more apparent. In 2015 the fourth album ‘Soul Samadhi’ went straight to the top of the charts and was critically acclaimed throughout the scene. Thorley is a rising name, born and raised in Saigon, Viet Nam. Started from 2015, he has amplified a career from the passionate crowd in front of him, also with the help of being surrounded by many enthusiasts and talented fellas. Furthermore, Thorley’s dream has been realised in no small part due to his massive effort. Also, Thorley was one of the most favorited students at Kool Studio (HCMC) and he is recently working as an instructor from Pioneer DJ Vietnam Center (HCMC). Mix Toe is an enthusiastic member of Vietnam Trance Lovers with more than 10 years in the community, showing love and passionate to Trance music. His career began in 2011 .He would like to introduce the deeply emotional feeling of trance music to more and more audiences in Vietnam as one of the admin crews of Vietnam Trance Lovers. As is the case with many other djs, trance is his hobby. Finding the time to learn the craft is difficult, but nothing could stop his passion for music. DJ and producer from Switzerland with more than twenty years of experience in playing and organising underground parties.